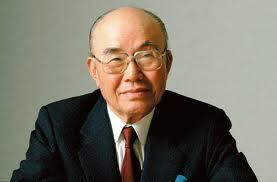 Soichiro Honda (本田 宗一郎 Honda Sōichirō?, November 17, 1906 – August 5, 1991) was a Japanese engineer and industrialist.In 1948, he established Honda and oversaw its expansion from a wooden shack manufacturing bicycle motors to a multinational automobile and motorcycle manufacturer. Honda was born in Tenryū, Shizuoka a small village under Mount Fuji near Hamamatsu on November 17, 1906. He spent his early childhood helping his father, Gihei, a blacksmith, with his bicycle repair business. At the time his mother, Mika, was a weaver. Honda was not interested in traditional education, his school handed grade reports to the children, but required that it will be returned stamped with the family seal, to make sure that a parent had seen it. Soichiro created a stamp to forge his family seal out of an used rubber bicycle pedal cover. The fraud was soon discovered when Honda started to make forged stamps for other children. Honda did not realize that the stamp had to be mirror-imaged. His family name 本田 was symmetrical when written vertically, so it did not cause a problem, but some of other children’s family names were not. Even as a toddler Honda had been thrilled by the first car that was ever seen in his village and often used to say in later life that he could never forget the smell of oil it gave off. Soichiro once borrowed one of his father’s bicycles to see a demonstration of an airplane made by pilot Art Smith, which cemented his love for machinery and invention. At 15, without any formal education, Honda left home and headed to Tokyo to look for work. He obtained an apprenticeship at a garage in 1922, and after some hesitation over his employment, he stayed for six years, working as a car mechanic before returning home to start his own auto repair business in 1928 at the age of 22.